In rural areas of Turkey the timing of rabies vaccination campaigns is very important because during the summer families work in the field during the day and only return to their houses in the evening. 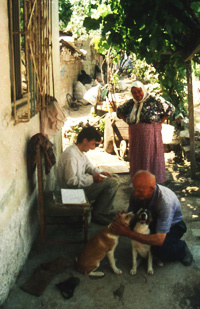 In order to reach as many dogs as possible during a very limited amount of time each evening, several staff members of the Veterinary Faculty of the Adnan Menderes University in Aydin participated in evening vaccination campaigns in villages, so that many dogs could be vaccinated simultaneously. To promote the campaign the imam was asked to make an announcement in the mosque during his Friday service, which is the most attended service. Posters were also posted at tea houses. A mobile vaccination point was set up (mostly close to the tea-houses) in each village and people would bring their dog(s) during a 1-2 hour(s) period. Two villages could be covered by the same team during one evening. All dog owners received a vaccination certificate and vaccination was free of charge. From previous studies, it was known that ownerless dogs are relatively rare in rural Turkish villages and that, in contrast to urban areas, most dogs can be handled easily by their owners. Therefore, through this targeted parenteral vaccination campaign adequate vaccination coverage was obtained among village dogs. Photo courtesy of Ad Vos. The importance of consistent and even vaccination coverage.